We've just entered the last two-week stretch of the Summer of Socks. My goal for the summer was to knit four pairs. Ha. Hahahahaha. 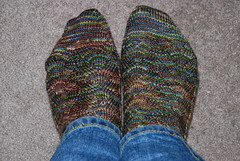 I just finished my first pair...well, actually, I finished them last weekend, but it's taken me this long to get pictures taken and uploaded. Pattern: Basic plain-vanilla sock formula -- 56 stitches around, slip-stitch heel flap, 2x2 ribbing on top. 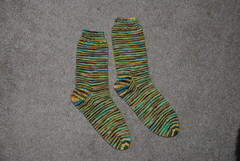 Yarn: Spunky Eclectic Supernova in "Route 66"
There's absolutely no excuse for why these socks took me so long to knit. 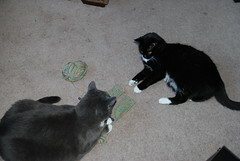 They were supposed to be my vacation knitting on Martha's Vineyard. I did get through one of the socks that week, finishing it in the car on the way home, but then I stalled out. It was a while before I cast on #2, and another long while before I finished it. It probably still would be unfinished if Tamara hadn't invited me out for some knitting in public last weekend! These aren't my usual color scheme at all, yet the yarn called to me for some reason. I bought it at the 2007 Massachusetts Sheep & Wool festival. This toe close-up is probably the best representation of the color. After finishing these, I decided that the best way to work through my knitting slump would be to start something new. 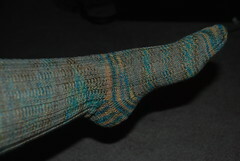 So I cast on for Leaflings -- a pattern from this year's BMFA sock club. I got through the ribbing, but I'm just not feeling excited about the pattern. The more I look at it, the more I'm not sure whether it appeals to me. So I set this aside for now...I need to decide whether I want to carry on with the pattern, keep the ribbing but do something else (my usual plain vanilla sock?) 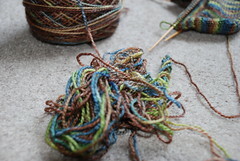 for the rest, or rip it out and use the yarn for something else. Any thoughts? Since I wasn't feeling the love, I decided that another mindless stockinette sock was in order. So I went and chose some of the prettiest yarn in my stash (it's my favorite yarn -- Fleece Artist Sea Wool -- in the "peacock" colorway). The colors are just so wonderful, it keeps me interested! Anyway, I'm off to a wedding. 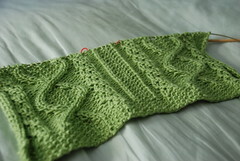 You know my goal of finishing the Swallowtail Shawl before the wedding in August? Yeah. THAT didn't happen either. 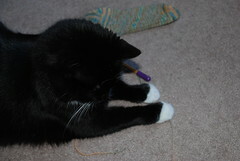 Today's post was going to be about my Tour de Fleece progress....but I was thwarted! My USB cable has disappeared from my computer again so I can't share pictures with you. Grumble. I will tell you, though, that I am nearly 2/3 of the way through my goal! Whoo! I've spun two of the rovings from my stash (my goal was to spin 3). 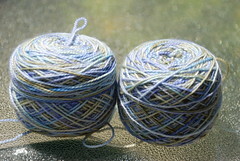 One of them is currently wound up on the niddy-noddy waiting to be washed and set; the other needs plying, washing, and setting. I'll be away for five days between now and the end of the Tour (and I won't be bringing any spinning with me!) so it'll be a mad dash to the end, but I think I can do it! Since I can't show you pictures of my pretty pretty yarn, I went though my iPhoto library to see if I had any recent things I'd photographed but not written about yet. And, indeed, there are a few WIPs that haven't made it to the old blog before now. So how about a brief glance at those? 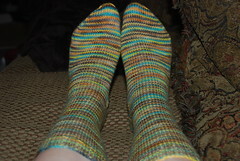 First up: my first Summer of Socks sock. Lots of people in the knitalong have already completed multiple pairs. I've gotten through a sock and a quarter. Go me. 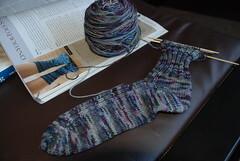 I worked on this sock while we were on vacation, and finished it in the car on the way home (these pictures were taken in the car somewhere along the Masspike -- Massachusetts Turnpike, for you non-locals :-)). I bought the yarn at last year's Massachusetts Sheep and Wool festival -- it's Spunky Eclectic "Super Nova" in the "Route 66" colorway. 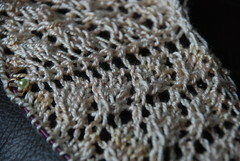 Next up: the Swallowtail Shawl. I'm rather farther along now than I was when this picture was taken, although I really need to get cracking -- my hope is to wear this to a wedding we're going to in August but with my abysmal track record when it comes to deadline knitting, I figure that's probably not going to happen! The yarn is Handmaiden Sea Silk, and it is gorgeous. That's all for now, I guess -- I'm off to ply, and I hope I can share spinning pictures with you soon! I'm a few days behind with my blogging. (Oh, who am I kidding? I'm generally a few days behind with my life.) 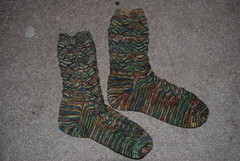 Last week I finished a pair -- sort of -- of socks. 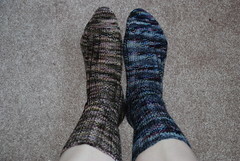 My replacement Brittany needles arrived so I was finally able to finish the sock on the right, and in the meantime I finished the sock on the left. Since they're the same pattern, they're sort of a pair, right? I'm about halfway through the foot of the mate for the left sock, and I'll do the right sock's mate after that. That's all for now. A drive-by post is better than no post at all, right? I had a few minutes in between things I'm doing today, so I took out the camera. 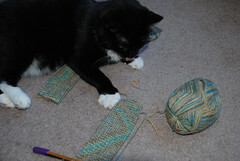 All I really wanted was to take pictures to update my progress on the various socks I'm working on at the moment. The cats had other ideas, though. I finally gave up on the idea of getting a picture of these socks WITHOUT a cat or two, so I went with it. 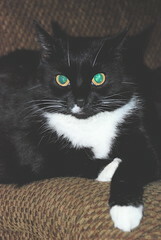 Maybe the cats are upset with my lack of Gratuitous Cat Pictures lately. Anyway, here's my Tofutsies socks. (Gandalf is laying on the one that's already finished.) These have been pretty much exclusively car-and-waiting-room socks, but now that I'm just a few rows from the heel on Sock #2, I think I might upgrade these to at-home knitting so that I can get them done. Sock-wearing weather is nearly upon us! You can see it best in one of the pictures above with Maggie, but I really like how the colors are spiraling around the leg of the sock. Sock #1 did that too, but not to the same extent. And as for my other socks...My replacement Brittany needles arrived today, so now I can carry on with my On Your Toes socks. 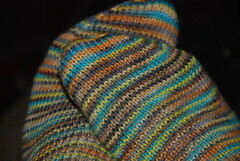 However, this week I got tired of waiting for them to arrive, and so I cast on for another pair, using the same pattern. :-) In these pictures it sort of looks like the same colorway, but it's not -- the yarn above is Jitterbug in Bright Charcoal, and the yarn below is Jitterbug in Castagna. So, that's all my socks. Mostly. I will now carry on with the rest of my Saturday. Happy long weekend! 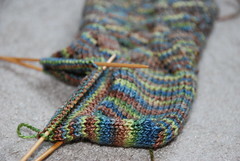 I can't make any progress on my toe-up socks until I get my new needles, but I can show you how they're looking so far. Check out my heel! I'm so proud of it. This sock was really going remarkably fast until I had my Needle Mishap. They're very soft and squishy and I really am anxious to finish the pair. I hope the replacement needles don't take too long! I'm taking a short break from socks (!) and working on a baby sweater as a gift for a baptism. Baby D, the recipient of the last blanket I knitted and the sons of old friends of ours, is being baptized on September 2, and if I get his gift out of the way, I'll feel good about myself. ;-) I'm knitting Trellis in some TLC Cotton Plus that has been laying around in my stash for a good couple of years -- it's left over from Soleil, which I knit long, long ago but have never really finished (it still needs the crochet edging). I started out on US7/4.5mm needles, but the cables were really not popping at all so I moved down to US6/4.0mm and I'm much happier with how it looks on this size. I'm knitting the 12mo size in the hopes that D. will be able to wear the sweater throughout this winter. I do hope it turns out well! Just a couple more rows before I start the armhole shaping. My Jitterbug socks are on hold for a while. Believe it or not, TWO of my DPNs broke! I'm not a particularly tight knitter, and I've never had trouble with Brittany DPNs before, so I have to believe that these two needles were defective -- both of them bowed pretty significantly before breaking, and the other three in the set aren't bowing at all. Plus, I was only knitting stockinette with them -- it's not like I was trying to execute a p3tog or anything weird like that. I emailed Brittany, as they say on their website that they will replace broken needles, but I just hope that they don't think that I'm making the whole thing up! This was my first time using this particular set of needles, too, so it's not like they were well-used or anything, either. 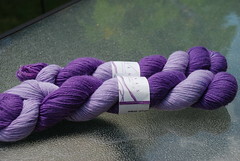 So, since I can't work on my current favorite project, I've been thinking about purple. August and September are the purple, brown, and orange months for Project Spectrum. Purple, as many of you know, is one of my very favorite colors, so I've been looking forward to using some of my purple stash during these two months. Will I get to all of it? I highly doubt it. :-) But I can dream! 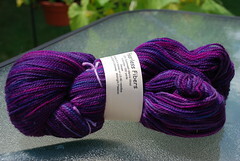 This is *gorgeous* sock yarn that I got from Fearless Fibers -- I bought it on ebay but I'm pretty sure she's now migrated her store over to Etsy instead. I really want to work with this, but I can't decide what the perfect pattern would be. Lorna's Laces in Amethyst Stripe. I think these need to be Jaywalkers. Or does anyone else have an idea for socks that look good with stripes? Plymouth Sockotta. I think these want to be gift socks for someone. Koigu. I reclaimed this yarn from a scarf that I'd been working on. It'll probably become socks now. 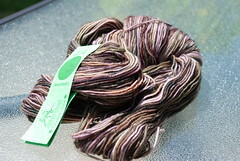 This isn't a very good picture of the color, but this Jitterbug is purple AND brown. Perfect! I also have some DK-weight Colinette Cadenza in this same colorway that wants to be a sweater -- I've been waiting for the right pattern. And of course, there are other Sweater Quantities. 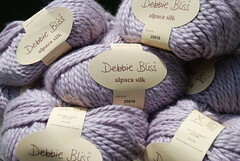 The yarn above is Debbie Bliss Alpaca Silk that is earmarked for Lara, and below is some Silky Wool in "plum". 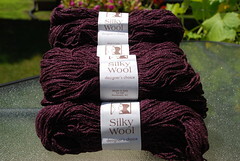 I want the Silky Wool to be one of the Elsebeth Lavold Viking Knits sweaters -- I'm just not sure which yet! I also have some brown-ish yarn (though nothing that is actually Brown-with-a-capital-B) and, believe it or not, some orange yarn. So I should be able to keep myself occupied with this color triad! 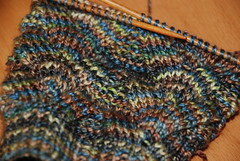 I was apprehensive about my first short-row heel. Tamara promised me that if I just followed the directions it would all come together even though it didn't make any sense to me in my careful read-through before starting. So tonight I threw all caution to the wind and tried it...and she was right! 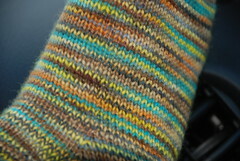 The heel turned out pretty darn close to perfect. 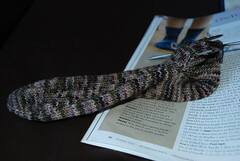 I haven't photographed it yet, but I will soon....probably when the sock is done! It's going quite quickly, which is unusual to say the least! The other day, I managed to find four (!) big hardcover knitting books on the super-clearance table at Barnes & Noble -- they were $2 each, plus they still qualified for the member discount. At that price, how could I NOT buy them? I haven't had a chance to really peruse them yet, and in fact I don't even remember what they all were, but Gandalf found them quite satisfactory. 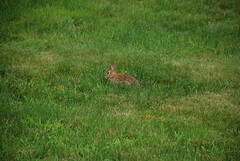 I know we have bunnies who live back there -- in fact, a couple of years ago, we had to rescue some baby bunnies who got stuck in the irises while we were mowing the lawn -- but we don't see them all that often. 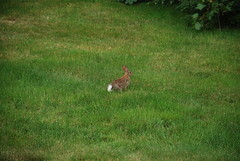 Check out the cute little cottonball tail! We have bunnies who live in the woods behind the library, too, and we see them quite often in the summer when we're leaving in the evening...well, we only ever see one at a time, though I'm sure there are multiple bunnies back there. Library Bunny is apparently quite used to people, and will sometimes let us get quite close before scampering off. 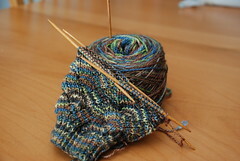 In other news, I've started my next sock -- toe-up this time! 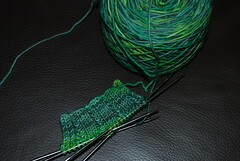 I'm nearly at the heel. I'm a little scared of the short-row heel, but Tamara assures me that if I just follow the directions it will all come together. Yarn: Less than one skein of Fleece Artist Sea Wool in "Woodland"
Modifications: None, except for the needle use I mentioned above. 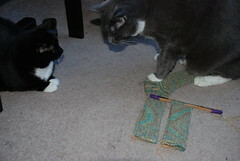 These do have their hiccups, as do all of my finished objects, but I knit them as written. I am in love with these socks and I can't wait till it's cool enough to wear them. Don't the colors look great with jeans? These are my official Oregon Souvenir Socks. I bought the yarn at Knit/Purl in Portland, and I chose a colorway that reminded me of the landscape. I decided to use the Monkey pattern because it made me think of both mountains and rivers -- two things that were central to many of the activities that we did while in Oregon. The Monkey pattern is wonderful. These only took me so long because I'd sometimes go days without working on them -- but when I did sit down to knit, they practically knitted themselves. There was something about the rhythm of the pattern that made it easy to knit a substantial amount all at once, and I always really felt like I was making noticeable progress. In comparison, the Tofutsies ribbed sock, which I was working on at the same time, just seemed to drag on and on and on...I'd knit for an hour and the sock wouldn't be any bigger. The Monkeys were the exact opposite. 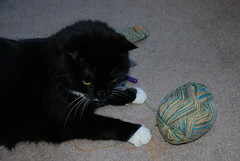 The yarn is great, too -- I think that Sea Wool has shot up to the top of my list of Very Favorite Yarns. 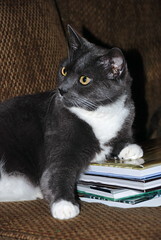 It is, of course, wonderfully soft, but it has this beautiful sheen to it too that makes it look very rich and elegant. Plus, you can't beat the colors. I'm not sure if seacell just takes dye really well, or if it's just the technique that Fleece Artist uses, but every colorway I've seen of this yarn is just so rich and vibrant. 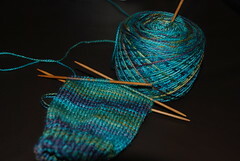 And now onto the next sock...I'm thinking I might take a skein of Jitterbug and try some toe-up socks. I still want to post some pictures of last weekend's trip, but first let's get a bit of knitting content out of the way. The good news: I finished a sock. The bad news: it isn't a match for Monkey. Monkey #2 is in progress, just barely, but while we were away last weekend I opted for easy 2x2 ribbing instead, and finished this Tofutsies sock. I love this yarn. Love. It. The picture doesn't show it well, but I really like how the colors swirl around the sock, and the yarn weight is really nice. It's hard to believe that these are 50% wool -- they don't feel wooly in the least! I have something else to show off, too, but I forgot to photograph it. 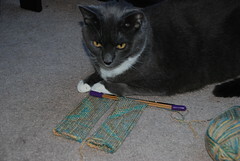 I have grand plans this weekend for a Ravelry-related photo shoot, so it'll be forthcoming. My Monkey #1 is moving right along. 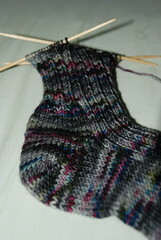 I turned the heel and am working on the gusset now. I decided to move down a needle size. It appears that 2.5mm, which is what is called for in the pattern, may be the elusive US size 1.5 (the one miniscule needle size I don't own), as all of my other US2 needles are, like the Lantern Moons, 2.75mm. So I moved down to a US1, 2.25mm, because that's what I had on hand. I think it's working out okay. Incidentally, isn't the point of a center pull ball to avoid things like this? It is very, very hot out. That's all I will say about the weather at this time. Ew. My Monkeys are coming along. I absolutely *love* this yarn -- it's Fleece Artist Sea Wool in the "Woodland" colorway. 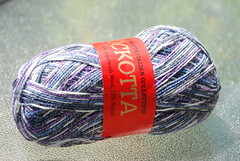 I bought this in Portland with the intention that this would be my "official" Oregon souvenir yarn. I couldn't decide at first what sock pattern to use, but I finally decided on Monkey -- not so much because Everyone Is Knitting Monkeys, but because the stitch pattern reminded me of the rivers and mountains that were so much a part of what we did on our trip. The yarn obscures the pattern somewhat, but it's just lovely. I'm at a crossroads right now. I must confess: I did not do a gauge swatch, and I realized after I was two pattern repeats in that the size 2 needles I'm using are actually 2.75mm, not the 2.5mm size 2s called for in the pattern. (Damn US needle sizing! I swear, I'm going to switch to metric.) 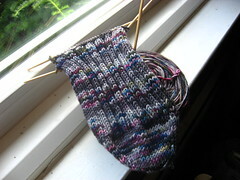 And the sock is looking just a smidge large -- not huge, but maybe a little bigger than I might want. That having been said -- I have, as they say, shapely calves, so while my current circumference may be a little big for my feet and ankles, it's not bad on my calves. So...I could rip out, swatch like a good knitter, and start again (which wouldn't be a huge loss -- this is just one evening's worth of knitting), or I could switch to smaller needles and make the lower calf and the foot at a slightly tighter gauge while still leaving enough room for my shapely calves in the upper part of the sock leg. I can make a case for either one. What would you do? In the meantime, we've got places to go and things to do -- so I think I'll work on my Tofutsies sock should the opportunity to knit arise, and I'll ponder what to do with my Monkey.